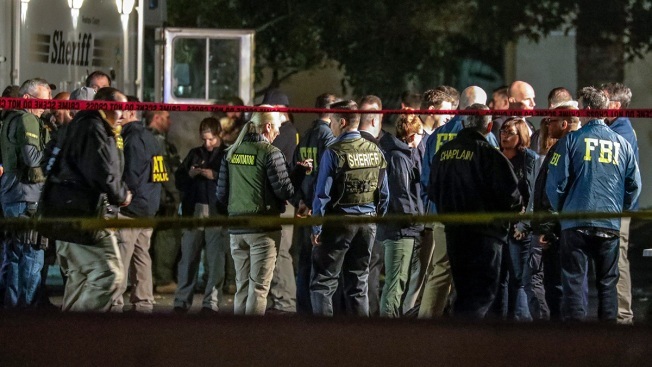 Sheriff and FBI investigators huddled after a gunman opened fire at a Thousand Oaks bar packed with hundreds of people attending a popular event for college students, causing multiple fatalities on Nov. 8, 2018 . The gunman burst into the bar around 11:20 p.m., cloaked in all black as he threw smoke bombs and began shooting at targets as young as 18 inside the Borderline Bar. The mass shooting in Aurora, Illinois, was the latest in a list of deadly shootings that have rocked the country. Here's a list of deadly mass shootings over the past few years. — Nov. 7, 2018: Ian David Long killed 12 people at a country music bar in Thousand Oaks, California, before taking his own life. Long was a Marine combat veteran of the war in Afghanistan. — Oct. 27, 2018: Robert Bowers is accused of opening fire at Tree of Life synagogue in Pittsburgh, Pennsylvania, during Shabbat morning services, killing 11 and injuring others. It's the deadliest attack on Jews in the U.S. in history. — June 28, 2018: Jarrod Ramos shot through the windows of the Capital Gazette offices in Annapolis, Maryland, before turning the weapon on employees there, killing five at The Capital newspaper. Authorities say Ramos had sent threatening letters to the newspaper prior to the attack. — May 18, 2018: Dimitrios Pagourtzis began shooting during an art class at Santa Fe High School in Santa Fe, Texas. The 17-year-old killed eight students and two teachers and 13 others were wounded. Explosive were found at the school and off campus.